After ending up homeless and penniless, Meghan is desperately seeking to transform her life at the Siena/Francis House. When Meghan arrived to our women’s shelter last October, she called herself a broken human being. "I felt like I had nothing to offer the world, and had absolutely no purpose in life. Deep down I knew I wanted nothing more than to have a job and a place to stay, basically a normal life, but I didn’t know how to achieve that,” she said. Not long after she arrived, Meghan heard about our Miracles Addiction Recovery Program, and asked our staff about how it worked. Within a week of that inquiry, Meghan found herself a Miracles Program participant. In this program, Meghan had regular appointments with one of the state-licensed counselors we have on staff. She was also required to go to recovery meetings and other life skill-building classes. With the help and guidance of her counselor, Meghan started the slow but steady process of working on herself – and to be of service to others, an integral component of our recovery program. Meghan did well in our Miracles Program, and was given more responsibility in the functioning of our shelter. 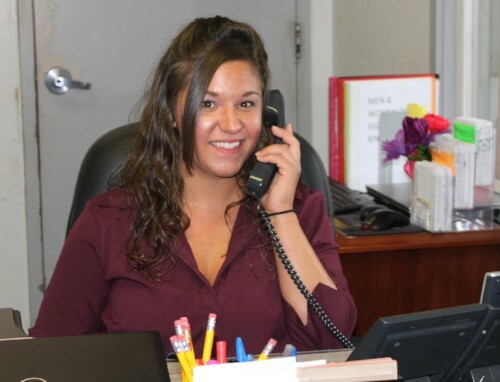 Meghan learned to work at our front desk and answer phone calls – gaining invaluable customer service skills. She also became a source of comfort and stability to the women guests of our shelter. For the past two months, Meghan has also been participating in a job training program through a Siena/Francis House partnering agency. Through that program, Meghan is learning additional work-related skills. Meghan is on track to graduate from our Miracles Program at the end of this summer, and is currently looking for a full-time job that she now knows she’ll be able to keep. Meghan is interested in becoming a nursing assistant or an occupational therapy technician. And, to assist her job search, a volunteer helped Meghan put together a resume, highlighting the job skills that Meghan has learned in the past eight months. Will you please make a gift this summer to help provide our services to people like Meghan? Your donation will immediately help us provide for the basic needs of food, shelter and clothing to Meghan and to hundreds of people like her. The Siena/Francis House tries to never turn anyone away, and we are dedicated to providing life’s necessities to those who come to us seeking assistance. Please CLICK HERE to online through our secure website. Summer is our slowest time for gifts, while many hundreds of desperate people come to us requesting food, shelter and safety every day. Meghan’s story is certainly not uncommon. Our shelter is operating at well over capacity, and we truly need your help to be able to provide food and a place to stay for the hundreds of hungry and homeless individuals who daily show up at our door, like Meghan. Please know how grateful we are to you for helping the Siena/Francis House provide our services to the poor and homeless when they have nowhere else to turn. Also know that these services are only possible because of your generous financial support, as nearly all of the contributions to our homeless shelter come from compassionate members of our community, like you. God bless you for your sustained friendship and support. I wish you all the best this summer. P.S. Please send your summer gift today to provide hope to people like Meghan. Our house is always open because of generous and caring people who send gifts for food, shelter, and clean clothes. Gifts to Siena/Francis House are used to provide food, shelter, clothing, and care of the people who turn to us during their hour of need, and are greatly appreciated. All of our services are provided at no cost to our guests. All gifts to Siena/Francis House are tax-deductible to the full extent of the law. Our audited financial statements are freely available by writing to Siena/Francis House, P.O. Box 217 DTS – Omaha, Nebraska – 68101. Our donor information is kept in strict confidence; our donor lists are never rented, shared, or exchanged with other organizations. The stories in our letters are real. Identifying details have been changed and file photos may be used to protect the privacy and therapeutic interest of our guests. For more information about Siena/Francis House or to include us in your estate planning, please contact Siena/Francis House Development Director, Tim Sully, at (402) 341-1821.